harveysbottomten: At last---a Bottom Ten Bowl? At last---a Bottom Ten Bowl? That's right_tickets out there priced at $2 (one Bottom Ten selector broke into tears at the plight of the poor, cut-throat ticket-brokers). Next week, expect to find Cal tickets on the shelves of 99¢Only stores. Elsewhere, last week's game between Tulsa and Texas of El Paso Interference caught the eye of the BT selectors. Reason: The game, featuring teams with a combined 2-8 record, was televised on Fox Sports 1. This was proof that Fox is finally showing some interest in airing a Bottom Ten playoff competition, the BCS (or Bowl Chump Series). Surely, there are many suitable sites available, including the Al Davis Gravel Pits of Irwindale, the Nevada Disproving Grounds, the Spruce Goose Flew the Coop Dome and Farmer's Field (the downtown home of the pro football franchise that L.A. will never be awarded). 11. North Carolina (1-4); 12. Iowa St (1-4); 13. UTEP (1-5); 14. Kentucky (1-5); 15. E. Michigan (1-5); 16. FIU (1-5); 17. SMU (1-4); 18. Idle; 19. Louisiana Tech (2-4); 20. Tulsa (2-4). 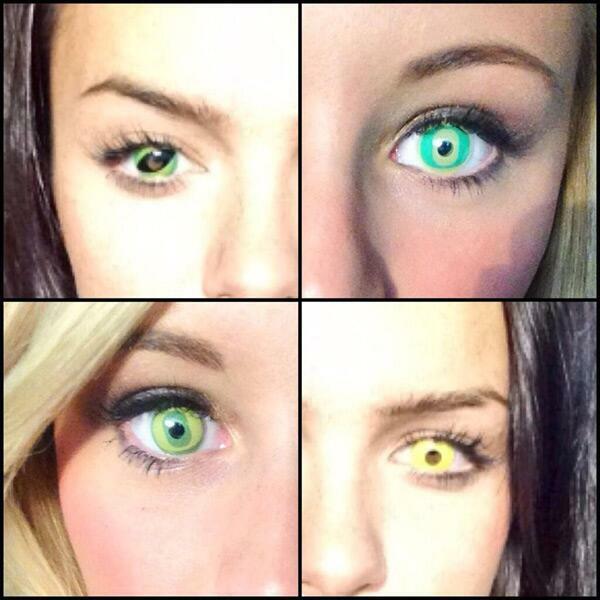 Eye, yi, yi: Oregon cheerleaders model green and yellow special contact lenses they wear in support of the Ducks (as well as Halloween). First, a round of applause, please, for the Pits Steelers, who recorded their first two takeways of the season Sunday. Yes, in their first 4 games, they had failed to intercept a single pass or recover one opponent fumble. This time the Pits picked off two passes and even emerged victorious against the fuel-less Jets, recording the 600th win in franchise history. At the rate the Pits are winning this year, it will only take them 187 years to notch their next 600 wins. As for No. 1 New Jersey, the Giants (0-6) go up against Minnehaha (1-4) in a sort of Bottom Ten Stupor Bowl on Monday night. The Vikings, in an obvious attempt to move up to No. 1, will employ Josh Freeman at QB, their 11th starting QB since 2005, not including Vinny Interceptaverde. 6. Atlantis (1-4); 7. Washington (1-4); 8. Pits (1-4); 9. Raiduz (2-4); 10. NFC East (7-16). Monday Night Flop of the Season: Minnehaha (1-4) vs. N.J. Giants (0-6). Dishonorable Mention: Detroit defensive tackle Stomp Again Suh was fined $30,000 for his latest cheap shot, bringing his total of lost salary to $209,000 in fines and about $165,000 for missed games_$374,000 in all, as he moves closer to becoming the first Million Dollar Man in a new category.